TICK CONTROL - "We kill what bugs you!" 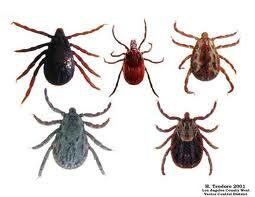 Ticks come in all sizes and colors. There are Hard Ticks such as the American Dog, Deer, Brown Dog, Lone Star, Western Blacklegged, and more. There are Soft Ticks such as the Fowl and the Relapsing. Ticks can transmit different diseases such as Lyme, Rocky Mountain Spotted Fever, Encephalitis, and many more making the control of ticks a very important part of pest control. Control of ticks is a five part process. The first being proper identification of the pest involved. The second being prevention. Denying access to areas such as crawls space and attics from wild animals is part of the prevention process. The third step is reduction of on-host parasites. This can be done only to domestic animals through treatment or bathing by a veterinarian. Indoor control is the next step and can be done through mechanical removal such as vacuuming, and cleaning and removal of harborage areas. Spot treatment with an appropriately labeled pesticide and insect growth regulator may be necessary after indoor sanitation. Outdoor control is the final step in this process. This is also one through mechanical removal of debris, harborage areas, and keeping the grass and weeds mowed to a low height. Removal of bird nest and other host nesting sites should be removed up to 100 yards away. Once all conducive conditions have been eliminated then an application of an appropriately labeled pesticide and insect growth regulator may be necessary. So if the ticks come a crawlin in give Hired Killers a call!